Our research and development of specialized welding equipment has allowed us to introduce an entirely new and unique fabrication process. 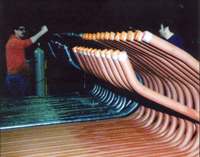 This process virtually eliminates the distortion that is normally associated with the manufacture of waterwall panels. 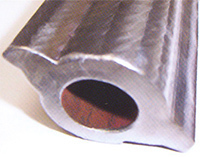 • Application of preheat and maintenance of heat throughout the welding process. • No bulging or distortion occurs during the welding process. • No extensive straightening is required after the panel is welded. • No stresses occur from the straightening process. 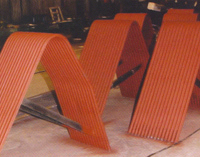 At ABT, we have combined the weld overlay and the manufacture of waterwall panels into one continuous operation. Now, out customers can "sole source" overlay panels, improving the price and delivery of overlay projects. 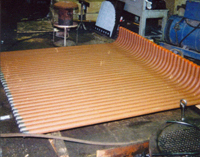 • The tubes and membrane are clad and straightened prior to the assembly of the panel. • Eliminates the distortion from cladding an existing panel. 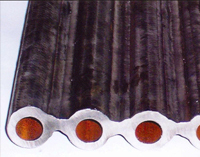 • Eliminates the risk of "blow through" in the cladding process. • As in our unclad Certi-Weld panels, no excessive straightening is required which is usually a considerable problem with overlay panels.